The Advanced Programmable controller delivers superior functionality by providing enhanced programmability features and an upgraded display over the Advanced Digital and Standard Digital models. AP controllers allow for temperature ranges as wide as -40°C to 200°C and programming options up to 100 steps in length. A real-time clock allows for event scheduling by tracking the actual time and date. The AP can be used in six different languages and delivers a temperature reading accuracy within a 1000th of a degree Celsius, while providing a temperature stability of ±0.01°C. With a variable speed pump system, flow rate is never an issue. The Performance Programmable Controller offers the most state of the art technology combined with the greatest capability. With an unlimited number of programmable steps and a temperature stability of ±0.005°C, the PP offers top of the line precision and versatility. A real-time clock allows for event scheduling by tracking the actual time and date. With a variable speed pump system, flow rate is never an issue. Temperatures are displayed with remarkable accuracy, within a 1000th of a degree Celsius. 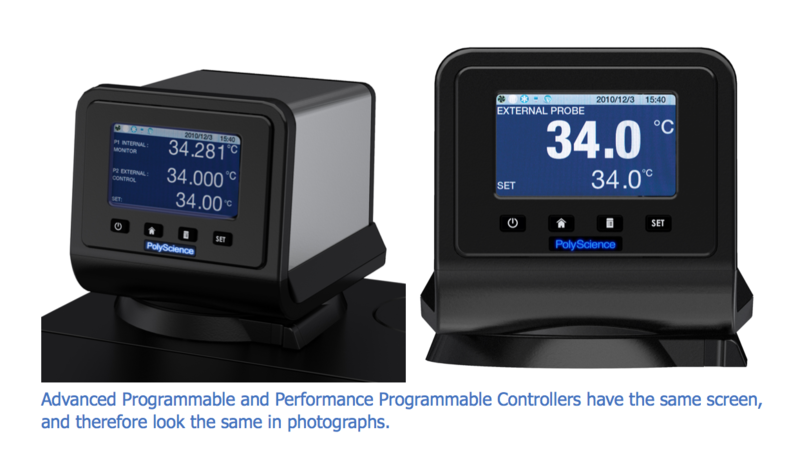 With 11 languages, a 4.3" full-color touchscreen and a multitude of connectivity options, the PP controller is truly the best in its class.